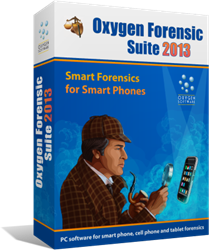 Oxygen Forensics announces the update of Oxygen Forensic Suite 2013, the company’s flagship mobile forensic and evidence discovery solution. The new release adds the ability to extract information from iOS devices locked with an unknown passcode, enabling acquisition of the latest iOS devices including iPhone 5, 5S, 5C, as well as all generations of iPad including iPad 2, 3, 4, Air and iPad mini with Retina display. iPhone 4S, 5, and 5S as well as the new generations of iPad were remaining unbroken for much too long. We solved the problem, providing investigators the way to find an access to information stored in passcode-protected Apple smartphones and tablets. The new release of Oxygen Forensic Suite enables acquisition of passcode-protected devices that were previously considered unbreakable, including iPhone 4S, 5, 5S, and 5C, and all generations of iPad including 2nd, 3rd and 4th generation devices. iPad Air Wi-Fi (iPad 4.1), iPad Air (iPad 4.2), iPad mini 2G Wi-Fi (iPad 4.4), and iPad mini 2G (iPad 4.5) are also explicitly supported. “We did what was long considered impossible”, says Oleg Fedorov, Oxygen Forensics CEO, “Breaking protection of Apple iOS devices using last-generation hardware. iPhone 4S, 5, and 5S as well as the new generations of iPad were remaining unbroken for much too long. We finally solved the problem, providing investigators the way to find an access to information stored in passcode-protected Apple smartphones and tablets with up to date hardware”. With the release of iPhone 4S and subsequent models, the ability to acquire data from passcode-protected devices was considerably limited. Only "jailbroken" phones or devices without a passcode (or protected with a known passcode) could be acquired. As relatively few users are "jailbreaking" their phones or use them without a passcode, the ability of investigators to perform in-house analysis of iOS devices started diminishing. Adoption of last-generation hardware has always been strong with Apple users. With iPhone 4 being the last model that could be easily acquired, a significant number of iOS devices used today were considered unbreakable. Oxygen Forensic Suite 5.4 changes the playing field once again. Introducing a way to acquire information from iOS devices using any currently available hardware platform, Oxygen Forensic Suite once again makes in-house analysis of Apple hardware a viable option. The new release of Oxygen’s mobile forensic toolkit enables investigators acquiring the content of all types of iOS devices regardless of their lock state or iOS version. Oxygen Forensic Suite 5.4 can force Apple devices to produce an iTunes backup, providing investigators access to all information stored in the device. The mobile forensic toolkit supports all current iOS devices including iPhone 4S, 5, 5S, and 5C, all generations of iPad including 2nd, 3rd and 4th generation, iPad Air Wi-Fi (iPad 4.1), iPad Air (iPad 4.2), iPad mini 2G Wi-Fi (iPad 4.4), and iPad mini 2G (iPad 4.5). After acquiring information from an iOS device, experts can use the many powerful analytic features of Oxygen Forensic Suite to investigate the content of the device. Oxygen Forensic Suite 2013 helps investigators and forensic specialists access and analyze data from a variety of mobile devices such as cell phones, smartphones, communicators, PDA and tablet PCs. Currently supporting more than 7,000 different models, Oxygen Forensic Suite 2013 covers the widest range of mobile devices compared to competition, and allows fully automated acquisition and analysis of supported devices.